Just Right TV This is a South New Jersey based team of videographers specializing in event and wedding videography, commercials, infomercials, and coverage for corporate, government and educational facilities. Good news in Catholic education! This video highlights how partnerships can benefit the academic and spiritual programs in an inner city school. Speaker James Dunne III is Senior Managing Principal of Sandler O’Neill + Partners, L.P. He had offices in The World Trade Center on 9-11 and shares stories about his faith and how Catholic Education helped him cope with the tragedy. Our Lady Star of The Sea School in Atlantic City students involved with the Notre Dame STEM program NDIgnite also participate in the discussion and an assembly follows. Also featuring Bill Gormley of DLA Piper Global Law Firm. A documentation of the devastation caused by Hurricane Sandy to this South Jersey shore community. Tuckerton, NJ After Hurricane Sandy 2012 from Just Right TV Productions on Vimeo. Here is the pdf of still photos (25mbs) from Cape May to Atlantic City of the overall damage from Sandy. For high res image purchase or to book an aerial shoot for your business please contact us. 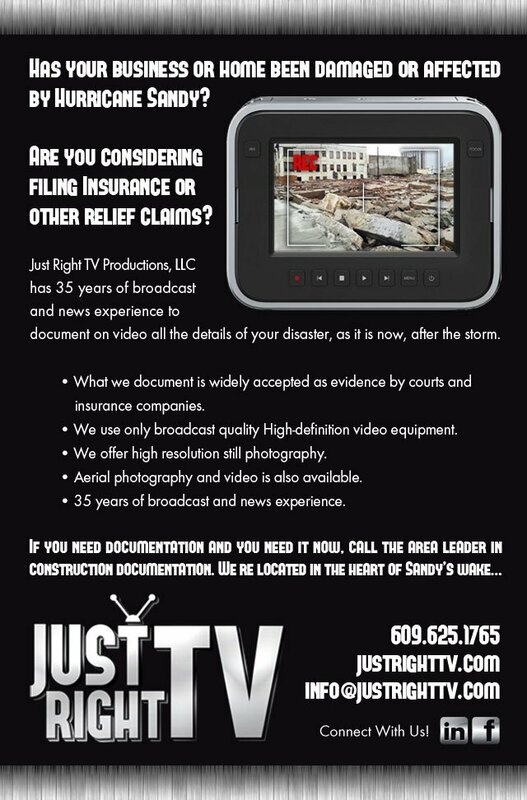 To view our ad about documentation after a disaster please click here. Here is an aerial overview of the shore destruction in Ocean City, NJ caused by Hurricane Sandy.